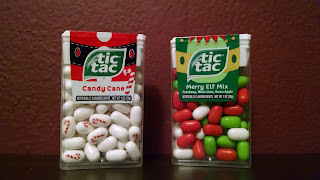 This year I spotted two types of Holiday Tic Tacs: Candy Cane and Merry Elf Mix. The box designs are kind of cute. The Candy Cane Tic Tacs each have a little candy cane printed on them, which is an extra nice touch. They taste... minty. What else do you want? I'm not sure I think they're candy cane specifically, they're closer to peppermint Altoid with a smidge more sugar. The Merry Elf Mix is more interesting. It's advertising the flavors as green apple, white lime (whatever that is), and cranberry. I don't often like apple flavoring, but I think this is pretty decent. It's a paler color than it looks in the picture, and it's a decent balance of tart and sweet for me. I suppose you could argue that these are winter-themed more than Christmas, but I'm not sure what else you associate gingerbread with. The bar itself, despite being rather sticky, did not have as much visible icing as the box cover might lead you to believe. The taste is somewhat gingerbread-ish, with a strong sense of synthetic spices. 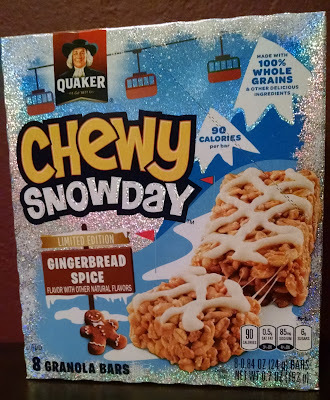 I suppose it's reminiscent of gingerbread, if gingerbread were liquefied and used along with corn syrup to glue together a bunch of oats and rice crisp-ish things. I generally like this brand of granola bars, but there's something about this that doesn't really work for me. Too much "natural flavor," not enough actual flavor. At least the package is very sparkly and has some dumb jokes on it. The things we do for your amusement. Seriously, I have a soft spot for Hostess Cupcakes and will occasionally treat myself. These special holiday pastries are... less of a treat. Do you like sugar? I mean, REALLY like sugar? These are at least a cheap source. The boxes were both fine, if generic. Both adequately conveyed the "holiday" aesthetic, although I'm still trying to scrub the cupcake mascot from my brain. The Twinkies are pretty - a nice dark red color. They look moist and sweet, and I was intrigued by the promise of peppermint. Unfortunately, the peppermint was more of a hint than a full flavor. Mostly the cake still just tasted of the corn syrup/imitation vanilla that is characteristic of mass-produced cake. I also found it slightly disturbing that the case felt slightly greasy in my fingers, yet dry in my mouth. I mean, I still ate it, but it concerned me. A few years ago we chronicled some of the odd uses of peppermint that appear in stores around this time of year. Here’s another for the list. 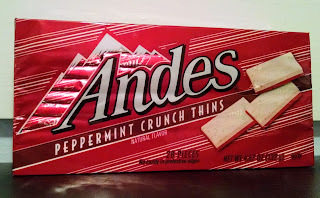 Andes Mints are, of course, already mint, but these are both explicitly peppermint and in shiny red packaging. Between this and the Peppermint Crunch Junior Mints (which are back this year, by the way), we've learned that the way you make something mint more Christmassy is by adding crunch. I did not know Christmas was crunchy. I assume that in both cases it's intended to be like bits of broken candy cane? The candy wrappers definitely have a candy cane thing going on. The actual mints are... okay. They aren't as good as normal Andes Mints, the white chocolate-ish substance is okay, but the crunchy bits actually take away from the texture. With the cold weather comes an uptick in tea-drinking, at least for me. 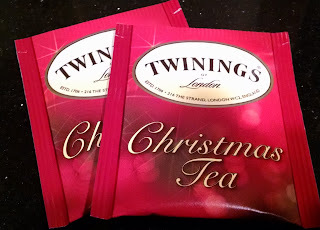 The third or fourth time I saw a display with these Twinings holiday varieties, I decided we should try them. This is described as a spiced black tea. Unfortunately, it mostly just tastes of black tea, although it smells of cloves and cinnamon. It also seems to smell faintly of citrus, but that might just be a mental association with cloves. It’s not bad for black tea with a slightly spicy aftertaste, but if I wanted something that mostly tasted of black tea I’d just buy black tea. I love herbal teas, and I love apple-flavored tea, so this should have been a slam dunk. It smelled nicely of apples while it steeped, but once done, it only smelled faintly of apple and something floral. The taste is too mild for me, at least when steeped for only the recommended time. I don’t mind chamomile, but the chamomile overwhelmed the apple and spice notes. Every now and then, Barnes & Noble will try to unload their old crap by marking it down by 50%. When that doesn't work, they push it to 75%, and when that fails, they let everything go for $2, regardless of its original price. I'll let you take one guess where these were in that life cycle when we picked them up. 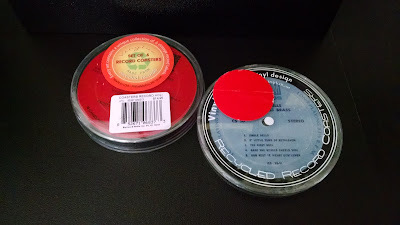 The concept here isn't bad - these are recycled records which have been cut down and laminated, so they'll function as coasters. They're a decent enough size, so it makes a degree of sense, though I imagine guests will be hesitant to set their drinks down on what really look like CD's at a glance. 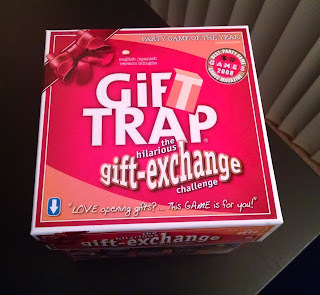 Each pack contains six coasters. Oddly enough, these weren't marketed as Christmas-themed. 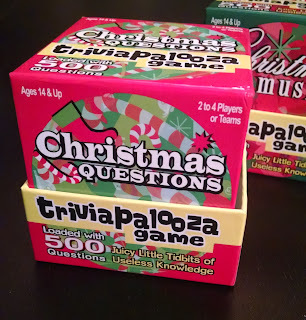 I just noticed the visible covers on both packs were holiday music, and took it on faith the others would be, as well. I was in look - all twelve were festive. There's even the remains of a Chipmunks album in the mix. I have a hard time imagining what the target demographic is for people who'd want to be sexually harassed by plastic mistletoe speaking in a fake accent so stereotypical, Pepé Le Pew would be offended, but apparently someone at Hallmark thought it was large enough to bet their job on. I'd like to take a moment to point out I found this marked down from $9.95 to $1.00 at Walgreens, and the person behind the counter looked surprised when I said I wanted to purchase it. The sound feature is loud and clear, which makes it easy to understand, even with the accent. It has eight different gags, which is more than things like this usually come with. Needless to say, both of these points should be considered as negatives. 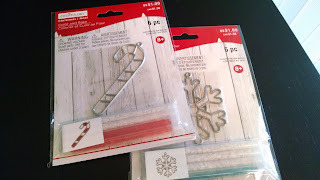 I spotted these in a dollar bin at Target this year. The printing on the tubes themselves is a bit cheap, but really not that bad for the price point. The Rudolph Red Berry is a pink color and smells like fake strawberry flavoring, like you might think of “red” flavor in lollipops or popsicles. It tastes faintly of the same. The Elf’s Story Mint Chocolate Chippey is a rather unappealing taupe color, and it smells a bit like cheap hot chocolate mix. I do taste a little mint in the mix, though. Like most balms of this style, the color of the balm is not noticeable when wearing, and the flavor and scent fade more quickly than a more expensive product. 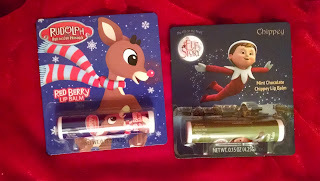 Also the feel of the balm (especially the Rudolph) feels a bit greasier to me than a Chapstick does, and seems to wear off faster.